I am a CS student and frequent intern interested in programming, finance and electronics. I like working on open source projects, writing blog articles, and reading on the internet. For fun I hike, bike, play dodgeball, and do hackathons and CTFs. Sometimes I learn about a topic by putting a lot of effort into a related project. A path tracer capable of rendering photorealistic images. Supports a physically based BRDF, textures, area lights, glossy reflection, DOF, CSG, fractals and more. A fast high quality syntax highlighting library in Rust. I continue to review PRs and maintain it. Powers two commercial products parsing terabytes of code per day. I built a working keyboard I created with AutoCAD, laser cut acrylic, custom firmware, and hand-soldered electronics. 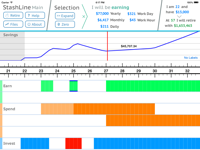 An IOS app for long term personal finance simulation. Instantly updates a visualization of your entire life’s financial future while you manipulate inputs. An LLVM based compiler for Turing as well as a Qt-based IDE and a simple drawing library. I like working on algorithms and then documenting them in long articles with diagrams. I wrote a detailed article about a tree diff algorithm I designed based on viewing the dynamic programming problem as path finding and applying A*. At Google I worked on a novel Conflict-Free Replicated Data Type for synchronizing text editing across devices, and wrote a detailed document about my work. I make small fun web apps for exploring data. A Rust web app for finding spurious correlations in 390k time series data sets. Uses custom optimized rendering, correlation and serialization code for instant responses. I extracted the link graph of Wikipedia into a 600MB binary file with a custom format designed for fast path finding in memory. I like writing articles about things I've learned and done. Explanations of my solutions to all the fun challenges I worked on in my first major CTF contest. I also wrote one about the DEF CON 26 Finals. I wrote about how the way I think about what makes for a good job has changed over the course of several internships. I wrote about my journey using TextMate, Sublime, Vim, Spacemacs (Emacs), Atom and eventually being happy with Sublime and what I learned along the way. This is a list of the things I have worked on and am currently working on. It is in kind of chronological order. I will try and write down all the things I have worked on. Unfortunately I don’t remember many of the things I worked on in years gone by. Redesigned the home page of my website to include more and better information. I competed in the DEF CON CTF Finals at DC26 with team Samurai, I worked on a number of problems which I wrote up here. I took Waterloo’s CS488 graphics course and spent a full time month of effort on making a fancy photorealistic path tracing rendering engine for my final project. Attended TerribleHack XI and made a “game” that renders directly from UDP packet buffers to the screen. Gave a short talk for the Waterloo CS Club on rendering with signed distance fields. Rigged up my Sublime Text to automatically maximize the current pane when I make its window small. Played with Samurai when we won the DEF CON CTF Quals, I solved a few problems which I wrote up here. Volunteered as the Treasurer for the Waterloo CS Club, also helped organize events like a CTF and TerribleHack. Played with Samurai in the Plaid CTF and helped with a few problems including reverse engineering a long APL program. Wrote scripts for auto-converting my bank and Splitwise CSVs into Ledger accounting files, with smart guessing of expense categories. Gave a talk at the Bay Area Rust Meetup about tips and tools for writing algorithms in Rust. Watched through the full fast.ai deep learning course, it’s really excellent, I recommend it for the great up-to-date tips even if you’re already familiar with deep learning. I built and programmed a box that uses a Teensy LC to allow me to connect $5 tattoo machine foot pedals to my computer to scroll and perform shortcuts. Implemented a combined head tracking and eye tracking mouse replacement in Rust using a TrackIR 5 and a Tobii 4C. Attended TerribleHack X and made a super-fast emoji rendering engine with WebGL. Organized a short talks event for the Waterloo CS Club and gave a talk version of my article on dynamic programming as path finding. Wrote Enfasten, a tool that transforms a static site into one that uses optimized responsive images. Helped reverse engineer the protocol of a commercial eye tracker, wrote a Wireshark dissector for their custom data format to aid understanding USB pcaps. Attended Hack The North 2017, where I made Quickdown, a fast lightweight markdown renderer from scratch using Rust and Webrender. Made a web app that creates an RSS feed of interesting Hacker News comments. Fixed some bugs and reviewed PRs for syntect. Made an example of integrating WebRender with the new glutin with live resizing windows on macOS. Fixed some bugs in nvAlt involving indented lists. Added an API to Hammerspoon for counting and switching macOS tabs. Wrote an example program of using my A*-based approach to diffing. Developed a Sublime Text command for folding all function bodies in a file so that you can read the type signatures and doc comments like generated documentation or a header file. Made a small web app for doing common normal distribution related calculations. Worked on the the Xi text editor for my internship at Google. Helped start NeoVintageous, a fork of the abandoned Sublime Vim emulation package, and contributed some fixes and updates. Fixed a whole bunch of parsing bugs in syntect found by running the Sublime Text syntax tests with it. Gave a talk on advanced Unix commands, programs and scripting for a CS Club “Unix 201” event I ran. Gave a talk on how text editors do syntax highlighting for “Alt+Tab”, a short talks event I ran for the CS Club. Volunteered as the Vice President of the Waterloo Computer Science Club. Organized and ran a number of events for them. Experimentally ported syntect to fancy-regex, a pure Rust regex library that avoids catastrophic backtracking. Completed the Shenzhen I/O programming game. Okay, it’s a stretch to say I “worked” on this, but it was super fun and I highly recommend it. Contributed some UI upgrades to the hledger-iadd entry system for Ledger accounting files. Packaged a Hammerspoon Module that uses my custom low-latency audio recognizer to let me scroll down hands-free by saying “ssss”. Wrote a Rust library for high quality syntax highlighting using Sublime Text’s grammar format. Wrote a project source code visualizer that renders all the code in a project using Rust and gfx-rs. Optimized Dayder to quickly handle the full 380,000+ data sets of FRED by using caching and optimized server side filtering. Also deployed it with NixOS. Participated in the Google Code Jam qualification round and the 2016 Waterloo Google Games. Wrote a high speed & accuracy webcam marker tracker with OpenCV and Halide. Done as part of a research term in the UWaterloo HCI lab. Gave a talk at a UWaterloo CS Club event on simple binary formats. Made Dayder, a spurious correlation finding web app, at TerribleHack III with Marc Mailhot. Made a new resume using Jekyll to generate multiple different versions from YAML, with a nice design using CSS flexbox. Reverse engineered the USB commands of my Eye Tribe eye tracker and used it to make part of a prototype eye tracking system. Wrote low latency high accuracy audio recognition algorithms for various mouth noises. Done as part of a research term in the UWaterloo HCI lab. Wrote a simple bond trading and arbitrage bot in a day with a team for a competition, in D, a language which my team members didn’t know and I had very little practice in. Scraped and generated a Dash docset for Vibe.d. Rewrote Rate With Science in the D language. See the Github release. Prototyped a pointing method fusing eye tracking and head pose tracking in order to compete with both the speed and accuracy of a standard mouse while not requiring a user’s hands. Done as part of a research term in the UWaterloo HCI lab. Started developing a prototype editor control scheme based around palm keys on fancy keyboards. Deployed Rate With Science deterministically using NixOS to a VPS using a Nix-based Heroku-like workflow. Wrote a facial key point tracking based program that overlays different faces on videos with OpenCV for TerribleHack. Wrote an election simulator game for Hack The North 2015. Built a head tracking mouse using a microcontroller and a headset-mounted IMU. Contributed OSX support and velocity control for the Mickey head tracking mouse project. Generated a Dash docset for D and contributed it to Dash. Rewrote Rate With Science in the Nim language. See the Github release. Made Rate With Science for the UWaterloo Terrible Hacks hackathon. Wrote a series of scripts to transform Wikipedia dumps into a compact binary link graph format that allows efficient graph searches. Wrote a JS Canvas app that makes some LCD monitors emit a tone. This made the front page of Reddit from /r/InternetIsBeautiful. Designed and built a series of one key keyboards with RGB leds that emulate blink(1) USB devices. Processed a Wikipedia dump into a Neo4j database using graphipedia on a DigitalOcean VPS droplet. Getting the data ready for use at a hackathon someday. Wrote a DBus service for finding the locations of interactive objects on the screen, part of a bigger eye tracking project. Wrote a program in Qt that uses image processing on your screen to detect any text and allow you to select it using vim keybindings. Wrote a program that allows overlaying dots anywhere on the screen, intended to be used to provide hints for use with an eye tracker. Developed an algorithm for detecting the noise of lips popping fairly accurately, intended for UI control uses. Wrote a window hints module for Mjolnir for SE hack day. Started using Spacemacs and contributing many PRs, making me the #2 contributor. Finished the VeloType implementation for my keyboard, started practicing. Started learning Emacs and contributing daily to open source Emacs projects like Spacemacs. Participated in Hack The North and developed Handquake. Wrote a command line tool for Waterloo Watcard info. Started attending the University of Waterloo. Built the electronics and firmware for my DIY keyboard. Released IndexView on Mr. Money Mustache. Designed and built a custom keyboard case out of layered acrylic. Wrote a tool for graphing and analyzing long term market returns. Used 3D printing to prototype a concept for magnetic levitation hall effect keyboard switches. Forked the ranger file manager to work better with OSX, creating MacRanger. Extended ranger file manager to support images and file icons on OSX. Went to the ECOO programming contest finals and came 4th (1st in region). Wrote a graphing program that follows all the school science rules. Made a program to generate function art for my math summative. Started work on a personal finance iPad app. Gave a lightning talk at Ottawa Ruby about writing Ruby Gems. Worked at Shopify over the summer. Integrated Pro into the Sublime Text editor via a plugin. Wrote Pro, a tool for managing Git repos. Won the Ottawa AppJam for my Turing Compiler and IDE, which I polished and linked together. Went to the ECOO programming contest finals and came 5th. Gave a lightning talk at Ottawa Ruby about scripting. Developed new website based on Jekyll and Github Pages. Started work on the eyeLike eye tracker. Wrote the Improsent presentation tool. Went to the Shad Valley summer program at Waterloo University. Released the PathSpan iPad app. Wrote a compiler for Turing using the LLVM framework. Created an open source fork of Turing for Windows with many improvements. Wrote a second iPad app for psychological research. Based on the number line task. Competed in the DWITE programming contest. Wrote a question answering machine for the programming club at Bell. Wrote a tron AI to compete against my friend Tony’s tron AI. Ported SquareGame to use data URLs to render to a favicon. Made a AJAX app that uses html5 drag and drop and the ideone API to run programs dropped on it. Put a bunch of my code on github. Made an iPhone game. A port of Kiran Rao’s square game to IOS. Porting the linux program to interface with my watch (Timex DataLink) to the mac. Ruby data analysis framework for use in programming contests. Turing browser for programming class assignement. Google Code Jam 2011 Qualification Round. 3D engine in Turing for programming class. iPhone app for my XML-based personal data sync and organization system. Ruby framework for my XML-based personal data sync and organization system. Ajax and php web app for my XML-based personal data sync and organization system. Science fair project on Galvanic Skin Response. Won gold medal in regional science fair. Flash platformer with procedurally generated levels. Bob escape platformer, a tiling platformer written based on a flash tutorial on tiling game engines. Taught small course on creating web pages to Grade 4-6 kids at my school. Started learning to program by writing crappy websites with HTML and JS. University of Waterloo CS Student.